B E S P I N » Archive » Dammit! Well folks, we learned some things this weekend. But, all things considered, we still had a pretty impressive launch. If you haven’t already “Heard the news” we unfortunately lost the payload. The down side is that yes, we lost everything and have to sit fingers crossed someone else eventually finds it and calls. The UP side is that we didn’t lost it due to poor planning or just lack of “knowing what we’re doing” on our part and we got some pretty impressive information out of the flight that will be incredibly helpful for our next launch. The day was a little rainy to start, so we postponed the launch about 30 minutes or so, and launched right around 2:30pm CST. 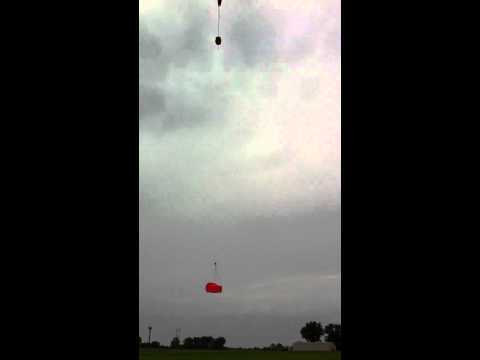 We had approximately 2lbs additional lift in our 3000g balloon carrying our 2.5lb payload up into the sky. She took of no problems and our aerial photographers were able to get some amazing shots (more on that soon! Need to get my camera back!) as they circled the payload for a bit before it headed off into the clouds. We tracked the balloon as it sailed across western Wisconsin, steadily climbing and even hitting speeds around 85mph. We eventually caught up with it just north of Wheeler, WI, but then something interesting happened. The jet stream and other upper altitude winds had carried it eastward, and it’d clearly gotten above the windy parts of the atmosphere, as it’d slowed to around 1-2mph, then suddenly it started heading back westbound. We were sure it was only temporary and the balloon would continue to slow, climb to 110,000ft+, break and come sailing back eastbound into our arms. But it kept going… and going. We hopped back in the car and began reverse chase, following it back over New Richmond, WI where it seemed to hit a max altitude and just stick there. It ultimately hung between the 106,000-107,000ft range and sailed all the way back around the metro area and headed south west towards South Dakota. We managed to stick with it until just outside of Hutchinson, MN, where ultimately the batteries in our Big Red Bee died and we lost all communication with the balloon. So we turned around and headed way back to the city… after 7+ hours driving across WI and back through MN. It had slowly started sinking and was down around 106,000ft, but it was clearly on no rapid descent. So our best guess at this point is its still up there, waiting for the helium to give out or the more intense rays of the sun to degrade the latex enough to break the balloon and it’ll cruise back down. Below are some cool screen grabs of the APRS.fi sit with all plot points as well as an export of the info as a Google Maps KMZ file. So, after a relatively restless night and Sunday full of research (and a little help from our Twitter pals), we discovered a very significant piece of information. Basically the one thing we overlooked was the strength of the balloon vs the amount of helium we’d filled it with. We essentially rose to an altitude at which the helium had expanded as far as it could against the natural strength of the balloon latex, and they essentially equalized. The helium couldn’t push any harder against the balloon, so it stopped expanding, meaning the balloon couldn’t rise any higher, and it just STUCK there. In our attempts to keep the payload as light as possible and use as little helium with as big a balloon as possible, ee failed to take into consideration the amount of helium we might need to ultimately outlast the balloon. A small oversight that ultimately cost us our first payload. But at the end of the day, a relatively important lesson to have learned… the hard way. The GOOD news is that we’ve figured that all out now and have already begun the re-building process and plan to launch next weekend, July 2nd, from a location TBD in southern Minnesota. We’ll keep you updated as we rebuild and prep for next weekends launch, as well as post pics taken of the BESPIN-I launch from the folks in the airplane. FLICKR PHOTOS FROM THE AIRPLANE! June 27, 2011 | Filed under Bespin and tagged with Bespin, high altitude photography, Weather Balloon.